Hawkman has been a tough bird to crack. The character has had so many incarnations it’s become somewhat muddled. Does that mean DC should just give up and not do another Hawkman story? Nope, It helps that this new series adds the art styling of Bryan Hitch. His detailed and realistic artwork works really well with the bird like subject matter. You can look and believe that a man with wings can fly. Venditti decided to go with the archaeology aspect of Carter Hall. 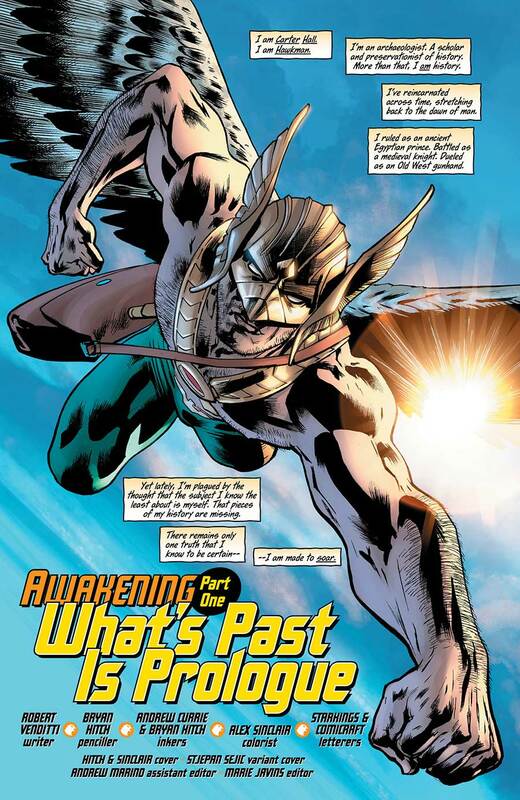 Hawkman has a nice “chase” item that helps him sort out his past and look to the future. They update the costume just enough to keep the classic style and give a modern appeal. Our hero also has an escape/battle with a character that’s a throw back to the Kubert days of the comic. The story is off to a good start and I personally hope it can maintain the readership during this newest series. I imagine the upcoming issues will add a supporting cast to increase the interest. I can’t wait to see what’s next.